Much as I love elegant simplicity of OD&D and its retro-clone, Swords & Wizardry, I have to admit that one of the greatest attractions of AD&D for me was its seeming complexity to outsiders. And few things concretized that attraction more than the Player Character Record Sheets first released in 1979 and later reprinted with a different colored cover in 1981. Both printings had the terrific Erol Otus artwork, but I'm pretty sure I owned the 1981 printing you see pictured to the left. If you ever owned these record sheets back in the day, I suspect you'll understand precisely what I mean. 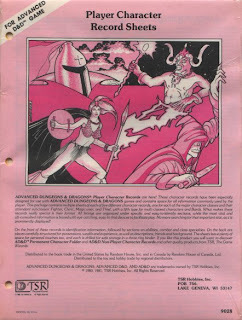 These sheets were gloriously cramped, with every nook and cranny filled with lines, boxes, and other areas intended to contain vital information about your AD&D character. "Vital," of course, is a relative word, since, along with things like hit points, armor class (including shieldless and rear AC), and known/prepared spells, there was also room for the percentage of his wealth your cleric tithes to his church, the name of your magic-user's familiar, and what disguises your assassin regularly uses. Now, some may argue that this is precisely why AD&D was such a miserable, tedious, newbie-unfriendly game and I certainly see their point. At the same time, this is precisely why AD&D held such an attraction for me and my friends. Mastering all these minutiae was like being initiated into a secret society and we felt a perverse pride in doing so. I think people often overlook just how appealing esoterica can be. To this day, I still contend these are the greatest character sheets ever made for any iteration of Dungeons & Dragons, possibly for any RPG. They were eminently usable rather than just being pretty -- though their non-photocopyable goldenrod color did hold a certain charm. The three-hole punching of the sheets pretty much ensured that everyone in my gaming group had a D-ring binder for each of their characters, so they could include the sheet along with other important bits of paper under a single cover, resulting in a kind of "mini-biography" of each PC. You could tell by looking at these binders what adventures a given character had undertaken, how much XP and treasure he'd gained, and lots of other small details from which amusing anecdotes could be spun later. This was true even -- or perhaps especially -- of dead characters, whose sheet and papers were typically removed from a binder and stuck inside a separate folder that served us as our Hall of the Glorious Dead (even though many PCs met their deaths in less than glorious fashions). If anyone wants to bask in the reflected light of these awesome character sheets, the amazing Mad Irishman has lovingly recreated them as customizable PDFs. They're well worth a look. Oh, mercy. The Mad Irishman does brilliant work. VerWord: "retednea" -- to repeat the act of sewing a parted seam in a stuffed animal, esp. a teddy bear. I never cared for any of the AD&D character sheets (whether for PCs, NPCs, or the Permanent sheets), but I love the monochrome Erol Otus cover art on all three. I remember the day I made my very first RPG purchase back in late 1980 (Holmes boxed set and MM). I looked longingly at the shrink-wrapped covers of the various character sheets, completely enchanted by the art. I loved these sheets, and the amazing Otus cover! My fondness for Otus's work compelled me to purchase the NPC sheets as well. I don't remember having any trouble photocopying these sheets, despite the goldenrod paper. Of course, these are somewhat quaint reminders of the old days. You could never get character sheets now because of the computer age, for the following reasons. 1) Better desktop publishing--most fans didn't have the capacity to do something that ornate back in the late 70s. 2) Spreadsheets--computers are now so ubiquitous that it's probably easier to keep track of the mathematics in such a device. 3) Piracy--the sheets were clearly marked with copyright statements and notices forbidding their copying. I think people would get laughed at now if somebody tried to sell a character sheet. "I think people would get laughed at now if somebody tried to sell a character sheet." The flashback from the Mad Irishman’s PDF is so strong that it’s inducing vertigo. I now want to play in a 1st edition AD&D game just so I can use it. I think my favourite D&D sheet is the Basic one. I love the simple utility of it; even if it's not pretty, it does the job, like a Land Rover. ;) I'm also a fan of landscape character sheets, and that was one of the few official sheets in that format. Oh snap, that drawing of a shoe at Move Base really really really takes me back. Haven't looked at those sheets in over 20 years! Feels just like yesteryear...except now my back hurts. Those sheets also got me trained for the very busy Champions character sheets I would be using years later. Thanks for the pdf. Seeing as I am running 1st ed. my players just might like to have 'em (gamenight tonight!). "though their non-photocopyable goldenrod color did hold a certain charm. "?!? In the early 80s I copied these things left and right and in between on a large old-school copier that used some sort of weird pink film and then on a regular home office style Xerox. They came out brilliantly perfect. I still have one original of each sheet. I just looked them over recently for inspiration while designing a sheet for S&W. Thanks for the shout-out, James! As my recreations show, I share your deep and abiding love for these sheets, which are inextricably linked in my heart to so many good memories. I do sometimes feel like my sheets are becoming increasingly irrelavant - some folks prefer the "kitchen sink" approach with 29-page fillable forms, Excel spreadsheets, or output from cool programs like Metacreator - as if the simplicity of the pen-and-paper character sheet was becoming an anachronism. More and more folks have the computers and software to make them, too, meaning just about anyone can make their own sheet and not have to shell out money for one. But it still amazes me how many bad ones there are! I found the Mad Irishman's work last year when getting ready for a EGG memorial event at a convention and was just dumbstruck at how incredibly awesome it was. As to the question of the relevance/wisdom of selling character sheets, I have to say that I am a fan of Green Ronin's Character Folio. The fun I had trying to recreate those sheets then is part of the reason why I enjoy typesetting the Open Design projects now. James said:Mastering all these minutiae was like being initiated into a secret society and we felt a perverse pride in doing so. I think people often overlook just how appealing esoterica can be.This is something that I have been pondering for a long time. I feel that there is probably an entire article--at least--in this. In my previous life I was a professional historian specializing in medieval magic, and I see a lot of parallels with the glorious grotesqueries of some medieval grimoires and the arcana of role-playing. I'm too young to remember these sheets, but I'll be damned if they aren't seriously cool. I liked the Basic D&D character sheets because they had so much more space, I writes BIG. AD&D character sheets were so beautiful, but these days as a DM, I have all of the stats pre-calculated and tabulated for the character party as a whole in a two dimensional Exel table with a line for each character ina few tables that cover 99% of the game mechanics, this way there is minimal distraction of looking up a number to roll during gameplay. We used these a lot, but looking back on them they are so....ugly! Lots of cramped writing in tiny script. A famous story in our group is a mage/thief who forgot he had a Ring of Elemental control because he couldn't find it in all the minutia...! Huh... I wouldn't really peg the name of your wizard's familiar as an example of 'minutiae', any more than your character's name would be. Favorite disguises for your assassin - maybe, but it's a nice bit of color. Tithing amount... depends on whether you're going to get into temple-building, I suppose. The cover with the monsters frightened because a player rolled a 18 is superb! Cool stuff! I had great fun playing around with these. Thanks Mad (in a nice way)Irishman.And thanks Mr G for bringing to our attention. Oh, one other thing: The only place that you could find carrying capacities listed for AD&D (for a sack, backpack, pouch, etc.) was on the inside cover of this booklet. I was always carting around my booklet just for that! I still use goldenrod when I can because of this. Maybe it's nostalgia but it is also my favorite character sheet.